Photo from Dr. James Maskalyk’s website, courtesy of Random House of Canada. WORDS: Tonight’s This Is Not a Reading Series event celebrates the launch of Six Months in Sudan: A Young Doctor in a War-Torn Village by emergency medicine practitioner and University of Toronto professor James Maskalyk. 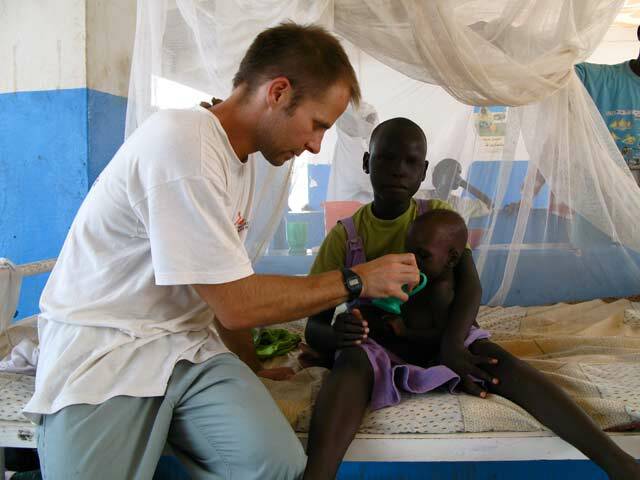 Dr. Maskalyk will talk about his memoir and his first tour of duty in Sudan for Médecins Sans Frontières/Doctors Without Borders with journalist and broadcaster Avril Benoit, also at MSF/DWB. The Gladstone Hotel (1214 Queen Street West), 5 p.m., $5 or P.W.Y.C., all proceeds go to MSF/DWB. CHARITY: Two V-Day events are taking place in Toronto today. The first, CONGO 101, is a teach-in designed to inform the public about the history of violence against women in the Democratic Republic of Congo. The second is the final event of V-Day 2009, a benefit concert called “Strike a Chord, Not a Woman.” The line-up consists exclusively of male singer-songwriters who raise their voices in solidarity with V-Day’s mission. Congo 101 at the Centre for Social Innovation (215 Spadina Avenue), 10:20 a.m. and 1:30 p.m., tickets $10; benefit concert at Trinity St. Paul’s Centre (427 Bloor Street West), 6:30 p.m., tickets $18 or $14 students. WORDS: The Globe and Mail and Ben McNally Books hosts a literary brunch today with four established authors, each speaking about their latest work. Gabriel Weston’s Direct Red is a surgeon’s account of hospital life, Joy Fielding’s Still Life talks about a comatose woman who hears the conversations of her hospital visitors, Colin Ellard’s Where Am I? explores our relationship with space, and John Demont’s Cole Black Heart investigates the rise and decline of the coal industry in Nova Scotia. King Edward Hotel (37 King Street East), 10 a.m., $45. THEATRE: Rum and Vodka’s premise is not complicated: a twenty-five-year-old Dubliner talks about his problems while engaging in a three-day drinking binge. The play, however, avoids being preachy and develops a nuanced portrait of the main character. Thrust into adulthood and fatherhood before he was ready, the anti-hero becomes a self-destructive alcoholic undone by his past. The play was written by contemporary Irish playwright Conor McPherson. The production ends today. Cameron House Back Room (408 Queen Street West), 8 p.m., P.W.Y.C. FILM: As mentioned earlier, the Toronto Jewish Film Festival has a diverse line-up of international films this weekend, including documentaries, short features, as well as full-length works. Notable screenings today include Holy Land Hardball, a documentary about baseball in Israel; Hey, Hey It’s Esther Blueburger, about a thirteen-year-old girl who escapes her bat mitzvah party; and My First War, which explores the Lebanese conflict in 2006 through the point of view of a soldier-photographer. Screenings take place at the Bloor Cinema (506 Bloor Street West), the Al Green Theatre (750 Spadina Avenue), and the Sheppard Grande Cineplex Odeon (4861 Yonge Street), see website for schedule, single tickets $12 or $7 for students/seniors. CHARITY: We’re excited about the Hibiscus and Roseships’s family-friendly tea party taking place at the Resistor Gallery this afternoon. With appearances by musicians like Erin Lang, Jesse Smith, Owl Eyes, and Snowblink, the party—which includes a bake sale and art show—promises fine entertainment while supporting the Hibiscus Fund for Hope. Second Floor, The Resistor Gallery (284 College Street), 1–6 p.m., $8 or kids FREE.